The Pound soared more than 300 pips and printed new yearly highs yesterday after the UK parliament voted to reject a no-deal Brexit. The bulls were relieved yesterday after the vote, but political uncertainty remains a major factor. The UK lawmakers has agreed to meet again today to try to approve an extension for the departure date and take March 29 deadline out of the table. Today, traders will mainly focus on that meeting amid lack of any economic data. The Pound broke above multiple resistance levels yesterday until price found resistance around 1.3350 (R1). The bulls need to break above this key resistance level to confirm their bullish narrative. 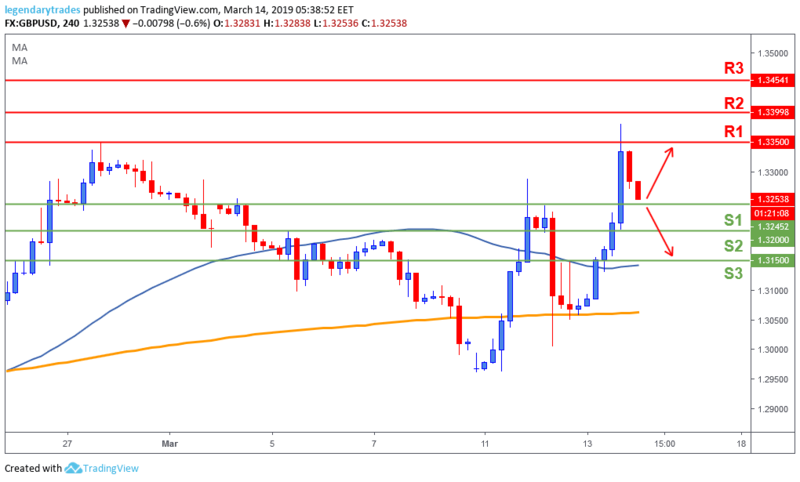 Currently, price is trading just above 1.3250 (S1) level, a break below this level will open doors for further weakness towards 1.32(S2) and possibly lower.